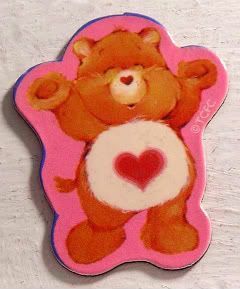 joy magnetism: This bear cares! One thing about growing up with sisters five and eight years younger than you, is that you end up living with not just your beloved childhood characters, but their beloved childhood characters as well. It's arguably one of the best things, as well. It's probably why I have a "slightly older for that demo who should have stopped loving them by now" affection for Strawberry Shortcake, the Smurfs, the Snorks, the Muppet Babies, Chip N' Dale Rescue Rangers, the Shirt Tales and of course, the Care Bears. Who doesn't love a good old-fashioned Care Bear Stare? And from Tenderheart Bear! He likes to give hugs, and make people realize that they actually care about things. That helps love grow. And spread across the land. And makes everything A-ok.
Well, that's what this Care Bears Official Handbook sitting in my lap says. What? You think I'm kidding? You're reading this magnetpost, aintcha? I figured joy magnetism could do with a little visit from the caring-est bear in Care-a-lot. My middle sister must have thought so, too, since she's the one who sent this Tenderheart magnet my way. Hee. Thanks. Who would have thought a tiny magnet could make me feel better. Mind you, that long list of 80s cartoons I listed up there? Just the tip of the iceberg, man. Don't ask how many times I had to avoid little girls running around sporting bandannas and nun chucks made out of cardboard paper towel rings and socks screaming Turtle Power!!!! Or how many times I had to hear Jem! Truly outrageous! Truly, truly outrageous! Not to mention I! Have! The Power!!!!!!! Hmmm. That baby sister who loved He-Man? Getting married in November. Now I'm starting to wonder if that's why we have brown sleeveless bridesmaid dresses. Hahahahaha. I wonder if having a sister who's 5 and 8 years older than us has something to do with us loving Sweet Valley High books and Sweet Dreams and soap operas and Duran Duran. And: Care Bears Official Handbook? Wha? Where? I wanna see, I wanna see! as for the brown dresses it has NOTHING to do with He-Man and more to do with the pockets! who doesn't want pockets! ?